This post gives a bit of a teaser for my EclipseCon talk next week. 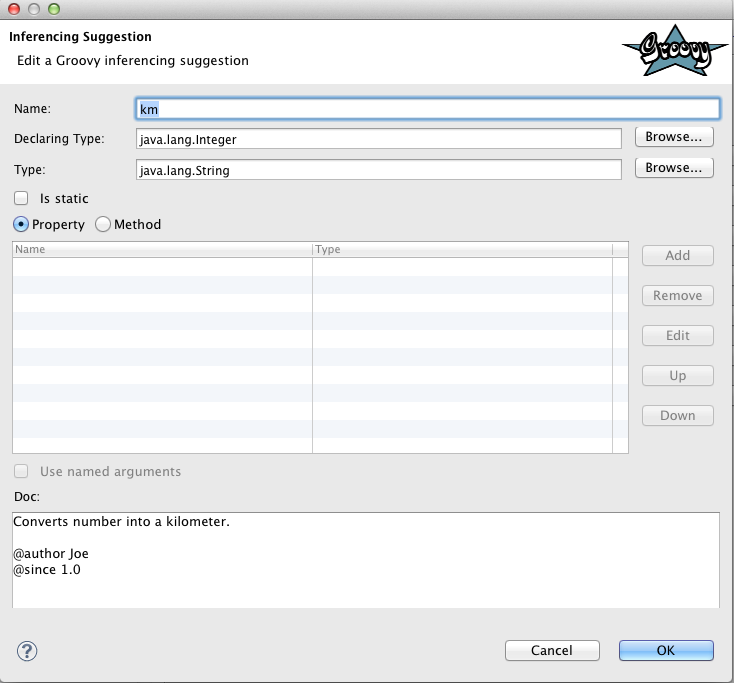 Groovy-Eclipse knows that the type of myString is java.lang.String. That is why substring is not underlined, but uh_oh is. All references that cannot be statically resolved are underlined regardless whether or not the program will fail at runtime (Groovy is a dynamic language, and we can't be certain about what happens at runtime). Uh-oh, underlines. The references do not make sense to the editor, even though this executes without problem. And I'll talk about each of them in the next sections. This is a powerful technique and gives you fine-grained control over exactly how your DSL integrates with Groovy-Eclipse. I have already written a full description of all the extension points available and how to use them to create a plugin that extends Groovy-Eclipse. This was the state of Groovy-Eclipse circa 2010. Clearly, another approach was needed. But in some situations, this feature moves too far in the direction of simplicity over expressiveness. Inferencing suggestions was not sufficient and we needed yet another kind of extensibility. A DSL descriptor (DSLD) is a Groovy script that describes your Groovy DSL. 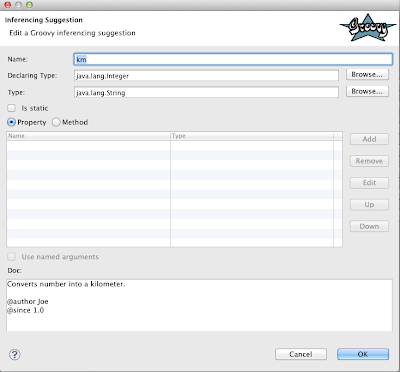 This script is compiled and executed by Groovy-Eclipse so that the inferencing engine can understand the DSL. They can be shipped with libraries and as long as Groovy-Eclipse can find these files on the classpath, they can contribute to type inferencing. I have already written a good introduction to DSLD. We created the DSLD language so that library developers could have fine-grained control over how their library and DSL gets interpreted in Groovy-Eclipse and also so that end users can transparently use this functionality without needing to install a new plugin or do any extra work. What kind of extensibility is best? I'd still recommend that you come see the talk at EclipseCon (if you are lucky enough to be attending the conference). I'll go into more detail on implementation and I'll show some live demos on how this all works. See you at EclipseCon! That was a great stuff. I am interested in learning the second approach "Inferencing suggestions (very light-weight extensibility)" where the idea is to embed this feature in a simple text editor for Groovy script itself. Is your goal to implement something like this outside of Eclipse in a text editor? Much of the implementation is tied to Eclipse itself. But let me know what you are trying to do and I can give you some advice.